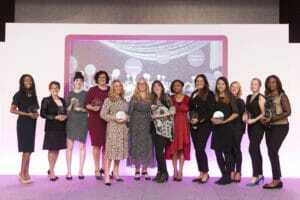 Forward Ladies has announced the winners of the National Awards and Summit for 2018, sponsored by HSBC UK. 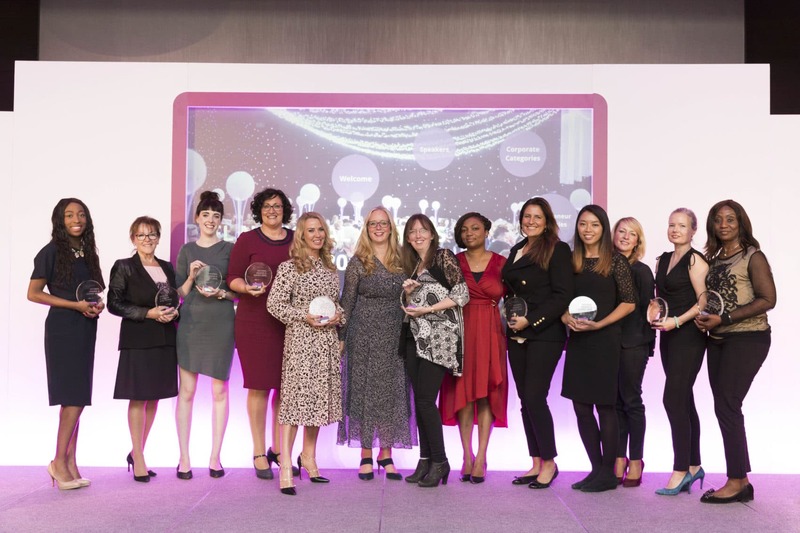 The Awards took place on Friday 28th September at a celebration lunch at the Hilton London Tower Bridge before an inspirational audience of senior and influential business leaders. 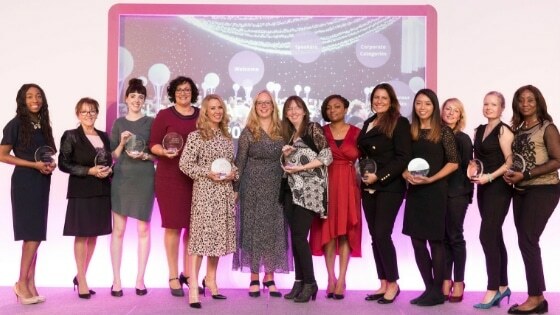 The eleven category winners will now take part in a judging day in Manchester in November, before a distinguished panel of business leaders, where they will join finalists from regional events in the Midlands, Yorkshire and the North East, and the North West, Wales and Ireland. The overall national winner will be announced at a grand finale to be held in Leeds on the 7th December. The keynote speaker was Helen Butters, a successful public and motivational speaker and best-selling author: Four Mums in a Boat which is published in the UK as well as Holland, Germany and America. An award-winning documentary of the same name was commissioned by National Geographic and has been broadcast around the world. In November 2017 she was privileged to receive an Honorary Doctorate from the University of York St John. The Awards were delighted to welcome back HSBC UK as key sponsor, and are supported by many sector leading businesses including GKN Aerospace and London North Eastern Railway. Kim is a legal counsel at Axiom Global Limited advising businesses from owner-managed businesses through to large, listed multinational groups in relation to a wide range of corporate transactions including acquisitions and disposals, joint ventures and group reorganisations. Kim is also a trustee and board member of a children’s charity and adoption agency specialising in placing children hardest to place. Currently UK Counsel and Director, Legal at Klarna Bank AB. A law graduate, she has worked for a number of organisations including senior legal counsel at Barclays, BAE Systems and legal director at HBOS. She is an executive director of Plan International UK and Aspiring Solicitors ambassador. Aimi started as a civil engineer with 6 years in the rail industry working on some of the UK's biggest construction projects such as London Underground station upgrades. Recently she made a career move into software development and now works for Sky. Head of consulting for National Security and Defence, BAE Systems and is responsible for 175 consultants. She advises government clients on complex transformation programmes and is also the founder and co-chair of the company’s gender balance network. A leading female entrepreneur, Women’s Rights Activist, Bestselling Author with new book Saving the World, and Founder and Chairman of three international businesses including luxury lifestyle management Sigillius. CEO of regional charity, SAMEE. As the mother of a disabled child, she has a huge passion for working directly with the most disadvantaged and disabled to increase their self-confidence and follow their career goals. A producer and co-founder of new microstudio Weather Factory, working alongside her partner. She’s responsible for production, marketing, biz and art, and at 28, she’s one of the youngest female founders in the games industry. A digital print designer and founder of my own contemporary womenswear brand Skeena S, based in London. Currently retailing both online and in stores, across the UK, Ireland and UAE. A self-confessed fitness fanatic and founded Tikiboo, fun and brightly patterned gym wear by combining her background in sales and marketing with her fitness instructor expertise. 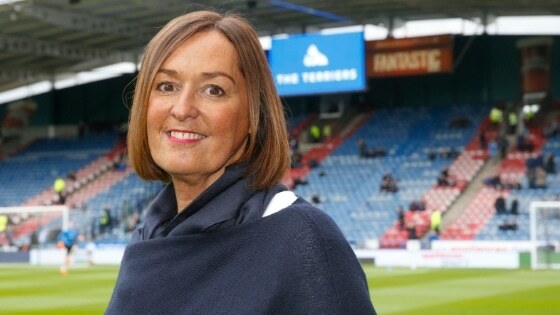 Chief executive of social mobility charity Leadership Through Sport & Business. Drawing on 30 years’ experience, she has developed the charity from serving 15 beneficiaries in London to over 300 nationally. Sarah completed a variety of generalist HR roles in the RAF before moving to Diversity & Inclusion in 2012. She enjoys working on positive culture change and in 2015 she was awarded an MBE.